As a cryogenic engineer, I had been aware of Parkinson’s disease (PD) since the 1950’s, and I self-diagnosed when I began to experience tremors – a diagnosis that was confirmed by my neurologist in early 2010. 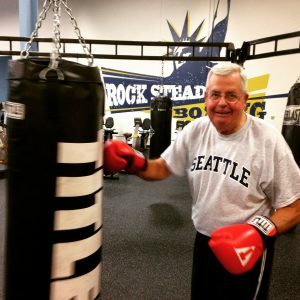 I called my college friend, John, who also has PD, and he suggested I check out Rock Steady Boxing…I loved the whole concept of “fighting back” and I have been going to boxing classes twice each week ever since. And on October 18, 2014, at age 75, I participated in and completed my first 5K race! It was a beautiful day in Carmel and there were over 300 participants. I was the oldest participant! I call myself a “participant” and not a “runner” because I walked most of the 3.1 miles. I did manage to jog the last 300 to 400 yards. My time was 65 minutes and I placed third in my age group – 70 or older. I was hoping they would have a category of 75 and older and I would have been first by default! So, is Rock Steady Boxing helping? Absolutely! My total well-being – morale, physical ability, and relationship with others is better because of Rock Steady. And because of the boxing exercises, I can still do everything I did before my PD diagnoses, like driving, yard work, typing, consulting as a cryogenic engineer, playing golf 2 or 3 times per week, doing community service and so on. I still can even still eat peas with a fork!